So over the past few years I've become more of football fan. It really all started when R1 began playing football in junior high school. My favorite NFL team is the Houston Texans. I know they are no Oilers but they are still my team. And since I cheer for the Texans you know what this means, I can not stand the Cowboys. The hatred dislike for the Dallas Cowboys really began when Hubs and I started dating. His entire life he has never liked the Cowboys and since I married him by default I do not like them either. 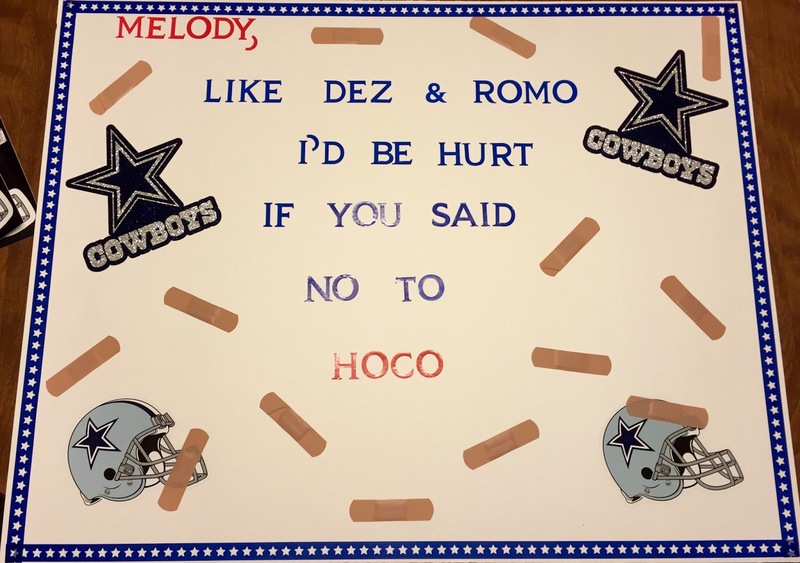 So when R1 came home from school last week and said he was asking a girl to homecoming and she liked the Cowboys I knew we were in trouble. 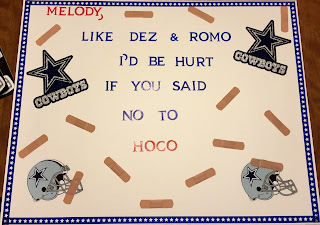 A big thing right now is how the boy asks the girl to homecoming or prom. The proposal is a huge deal. So with this in mind Hubs and R1 went work trying to come up with something Cowboys related. And since it was Cowboys related this meant I was going to have to step foot in the Dallas Cowboys Store and purchase a few things. So Saturday R1 and I went to the store and made a purchase. As I walked out the door I shuddered. I could not believe I walked in, found a few things, and paid for that junk with my hard earned money. Hell must have frozen over. And all in the name of homecoming. What a cute sign! So?! Did she say yes????@@@@!!!! !